There are two main reasons why the chemical process industry should be motivated to reduce energy consumption and CO2 emissions: rising concerns in companies, the public and scientific community about climate change or global warming, and the increasing fraction of energy in manufacturing costs. 'Climate change'  in this context, means a change of climate, which is attributed directly or indirectly to human activity that alters the composition of the global atmosphere and which is in addition to natural climate variability observed over comparable time periods.
' 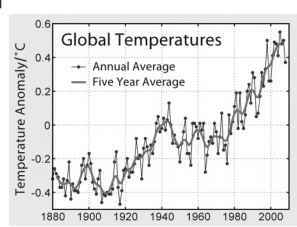 Global warming ' [ 2] is the increase in the average temperature of the Earth' s near-surface air and oceans since the mid-twentieth century and its projected continuation. Global surface temperature increased 0.74 ± 0.18 °C during the previous century  (see Figure 1). • Dry regions are projected to get drier, while wet regions are projected to get wetter: 'By mid-century, annual average river runoff and water availability are projected to increase by 10-40% at high latitudes and in some wet tropical areas, and decrease by 10-30% over some dry regions at mid-latitudes and in the dry tropics ...'. • Drought - affected areas will become larger. • Heavy precipitation events are very likely to become more common and will increase flood risk. - Water supplies stored in glaciers and snow cover will be reduced over the course of the century. • The resilience of many ecosystems is likely to be exceeded this century by a combination of climate change and other stressors. Figure 1 Development of global temperature . • Carbon removal by terrestrial ecosystems is likely to peak before mid-century and then weaken or reverse. This would amplify climate change. • Globally, the potential food production will increase for temperature rises of 1-3 °C, but decrease for higher temperature ranges. • Coasts will be exposed to increasing risks such as coastal erosion due to climate change and sea- level rise. • Increases in sea-surface temperature of about 1-3 °C are projected to result in more frequent coral bleaching events and widespread mortality unless there is thermal adaptation or acclimatisation by corals. • Many millions more people are projected to be flooded every year due to sea-level rise by the 2080s. There are many reasons to take action against climate change, the main reason being that climate change has become an important issue discussed by the public, in politics, society and industry. The IPCC concludes that increased greenhouse gas (GHG) concentrations resulting from human activity, such as burning fossil fuels and deforestation, were responsible for most of the observed temperature increase since the middle of the twentieth century. The main GHGs in the Earth' s atmosphere are water vapor, carbon dioxide, methane, nitrous oxide, and ozone. 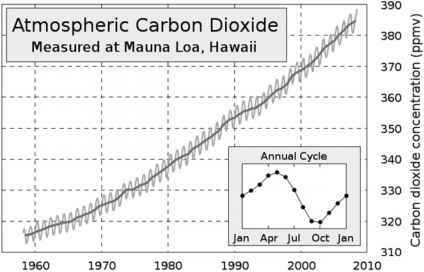 One example of that could be the concentration of CO2 in the atmosphere, which increased from 320 ppmv in 1960 to nearly 390 ppmv by 2008 (measured at Mouna Loa, Hawaii) ' 7] (see Figure 2). The IPCC also concludes that variations in natural phenomena such as solar radiation and volcanoes produced most of the warming from pre-industrial times to 1950 and had a small cooling effect afterward [8, 9]. Figure 2 Development of the atmospheric CO2 concentration . These basic conclusions have been endorsed by more than 45 scientific societies and academies of science, including all of the national academies of science of the major industrialized countries . A small number of scientists dispute the consensus view. The GHG emissions are normally expressed in CO2 equivalents because GHGs differ in their warming influence on the global climate system, due to their different radiative properties and lifetimes in the atmosphere. These warming influences may be expressed through a common measure based on the radiative forcing of CO2. The CO2-equivalent (CO2e) emission is the amount of CO2 emission that would cause the same time-integrated radiative forcing, over a given time horizon, as an emitted amount of a long-lived GHG or a mixture of GHGs. The CO2e emission is obtained by multiplying the emission of a GHG by its global warming potential (GWP) for the given time horizon. For a mix of GHGs it is obtained by summing the equivalent CO2 emissions of each gas. Equivalent CO2 emission is a standard and useful measure for comparing emissions of different GHGs, but does not imply the same climate change responses. Figure 3 shows that CO 2 is the most important anthropogenic GHG (data from ). Between 1970 and 2004, annual CO2 emissions have increased by about 80%, from 21 to 38 gigatonnes (Gt), and represented 77% of total anthropogenic GHG emissions in 2004. Industry directly emitted 19.4% of the GHG in 2004 and is responsible for a part of the 25.9% of GHG emissions caused by the energy supply. Figure 3 Global annual emissions of anthropogenic GHCs from 1970 to 2004 (after ). 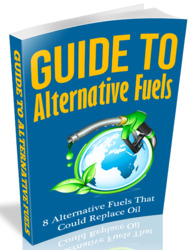 to GHG reduction. In this book we want to discuss ways of reducing GHG, especially C02, from the perspective of the chemical process industry. • The basic chemicals industry, which manufactures polymers, bulk petrochemicals and intermediates, other derivatives and basic industrials, inorganic chemicals, and fertilizers. • The life sciences industry which includes differentiated chemical and biological substances, pharmaceuticals, diagnostics, animal health products, vitamins, and crop protection chemicals. • The specialty chemicals or fine chemicals industry, which produces electronic chemicals, industrial gases, adhesives and sealants as well as coatings, industrial and institutional cleaning chemicals, and catalysts. 1) On the one hand, due to the energy-intensive nature of its manufacturing processes, the chemical process industry is directly responsible for the burning of fossil fuels and resulting C02 emissions. Furthermore, the chemical industry processes fossil fuels like petroleum or its derivatives as raw materials for the manufacture of different products. Therefore, it is part of the problem. 2) On the other hand, the chemical process industry delivers materials and products (like insulation materials, fuel additives and many more) that help to enhance the energy efficiency in many different fields and thereby reduces the emission of C02. For this reason, the chemical process industry is also part of the solution. The International Council of Chemical Associations (I CCA) estimates that in 2005 the C02e emissions linked to the chemical industry amounted to about 3.3 Gt C02e +/- 25% . The majority of these emissions, 2.1 Gt C02e, resulted from the production of chemicals from feedstock and fuels delivered to the chemical industry. An additional 1.2 Gt C02e of emissions arose during the extraction phase of the feedstock and fuel material, and during the disposal phase of the end products. Figure 4 illustrates the numbers. The I CCA study  also states that gross savings by the use of a chemical product vary from 6.9 to 8.5GtC02e depending on the scope and assumptions used. This translates into a gross savings ratio of 2.1:1 to 2.6:1. The gross savings ratio is the amount of C02e saved through the use of a chemical product measured against the amount of C02e emitted. In other words, for every GtC02e emitted by the chemical industry in 2005, C02e savings of 2.1 to 2.6 Gt were achieved, thanks to the products and technologies provided to other industries or users. Figure 4 Total life cycle C02e emissions linked to the chemical industry (2005) (after )* Gases with high Global Warming Potential like SF6 (see  for details). Nevertheless it is the goal of the chemical industry to further reduce the specific emissions of GHG per ton of product. A study by McKinsey ( [ 13] , cited in [ 12]) leads to the result that the 2.1 Gt CO2e emissions linked to the chemical production in 2005 can be nearly equally assigned to direct energy emissions (fuel consumption required by the process to run, 0.6 Gt CO2e), indirect energy emissions (energy generated off-site, 0.8 Gt CO2e) and process emissions (mainly N2O, CO2 and chlorofluorohydrocarbons, 0.7Gt CO2e). In other words, two^irds ofthe GHG emission of the chemical production is caused by its energy consumption. The direct energy emissions for different fuels and regions are presented in Figure 10, in Section 3.2. Energy efficiency is therefore an important lever for GHG reduction and a way to achieve the GHG reduction goals of the industry. 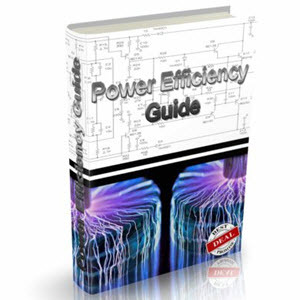 At the same time energy has gradually become an important cost factor. Energy costs amount to a major fraction of the manufacturing costs of a product. Enhancing the energy efficiency of the production means therefore not only reduction of CO2 emissions but also reduction of costs. This is an additional reason why the issue of CO2 emissions should be addressed by companies who want to remain competitive.